Out of the box, WordPress includes a great feature for standardized use of images on your website. This option for featured images makes it very easy to handle images and let WordPress automatically generate thumbnails for use on various locations across your WordPress website. WordPress themes by MH Themes make use of featured images to automatically display thumbnails within posts, on archives and in widgets to ensure a professional appearance of your website. As you can see in this example, instead of displaying thumbnails, the MH Magazine theme displays gray image placeholders. This will also occur if you have manually embedded images into your post content. This is because although you’ve inserted images into your posts, these images are not set as featured images in order to tell WordPress that these images should be used as thumbnails. In order to provide thumbnails for your posts, you just need to set featured images, which will be covered in the next section of this article. In case your posts contain embedded images which you’ve previously uploaded through the WordPress media library, then this process can also be taken care of automatically by making use of plugins to set featured images for old posts. Quick Tip: In case you don’t want to make use of thumbnails in the MH Magazine theme for some reason (which is in general not recommended), you can hide the gray image placeholders with a line of CSS. As soon as you’ve uploaded new featured images for your posts, WordPress will use these images to automatically generate thumbnails for various locations across your website. In case you’re not uploading new images, but using previously uploaded images from your media library, you might need to regenerate thumnails in order to have consistent image dimensions on your website. If you have lots of old posts on your website without featured images, then you probably don’t want to set featured images manually for all these previously published posts. Luckily there are plugins for this purpose which can automatically take care of this job. An example for such a plugin is Easy Add Thumbnail from the official WordPress Plugin Directory. However, please keep in mind that in order to make this work properly, you need to have at least images embedded in your post content. The plugin will take the first uploaded image from your post and use it as featured image. As soon as you have set an image as featured image on posts, it will not only appear as thumbnail on archives and within custom widgets, but usually the image also will be displayed at the beginning of your post content. This comes very handy because when you’ve set a featured image, you don’t necessarily need to include the image manually into your post content. However, you might have added the same image already within your post content (especially when dealing with old posts) and this may lead to a scenario where you have duplicate images displaying in your post content. As mentioned before in this article, when uploading images, WordPress will generate various thumbnails that will be displayed across your WordPress website. These thumbnails and their image dimensions are predefined by your WordPress theme to ensure consistent images and a professional appearance and high-quality presentation of the images on your website. For example when running online magazines or news websites, it’s very common to have images in landscape format (e.g. aspect ratio 16:9, 4:3 or else) and as soon as you upload images via the WordPress media library, these images will be cropped accordingly (if necessary) to generate the required thumbnails for use on archives and within widgets across your website. If you upload images that are significantly different than what is being required on your website (e.g. images in portrait format like book / movie covers, although your theme displays images in landscape format) you eventually will run into issues with image cropping. That is because the original uploaded images simply don’t meet the image requirements. However, in such cases it’s possible to modify the image dimensions to meet your personal requirements. As an alternative to changing image dimensions with code modifications, you can also manually affect the cropping of the images on your website. This comes especially handy if the general image dimensions on your website meet your requirements, but some images are not getting cropped as you like. In that case you could make use of plugins like Manual Image Crop to manually crop particular images based on your personal needs and requirements. It’s great if your previous WordPress theme did already support featured images. But in case you have previously uploaded featured images and changed your WordPress theme afterwards, it usually happens that your images are not consistent in size. In that case the images on your website may appear too large or too small or the images might even mess up your layout. Regenerating thumbnails with the “Regenerate Thumbnails” plugin. The reason for this inconsistency is that every WordPress theme defines its own image dimensions for the thumbnails that are being used on your website. If you change your WordPress theme, the images on your website usually will still have the same dimensions that have been defined by your old theme. You can easily resolve this inconsistency by regenerating your thumbnais. Here you can find more information: How to regenerate thumbnails after a theme change. Having issues with images in WordPress? Hi, the featured image option does not show up on my post page. Can you please help? Hi David, when you edit a post (not page), you could click on Screen Options in the upper right corner and check if you possibly have disabled the featured image box. Thanks a lot for the description how to disable the featured image globally for all posts. So easy, I was searching for quite a while now 😉 Thanks! Thumbs up! Hi Chrissie, you’re welcome and we’re very happy that we could help! I would like the thumbnails in the MH Carousel widget to be the same size. How can I do this? Hi Lawrence, you need to ensure that the uploaded images meet the minimum requirements as stated in the theme documentation and then regenerate your thumbnails. I do not have the Post Options box in my MH Newsdesk theme, and it is not available in the screen options. Any idea why? Hi Hans Christian, in the MH Newsdesk theme you can globally disable the featured image on posts through the particular option in the customizer. The Post Options box which you’re referring to is included in the MH Magazine theme and this box covers several elements of the theme (advertisements, featured image and subheading). When I use the featured image, the image being inserted into the article is huge. How do I change the size of the image being put into the article? Hi Keith, if you’re using a premium WordPress theme by MH Themes, you could for example disable the featured image on posts and embed the image through the WordPress editor instead as you like. If you want to actually modify the image size of the featured image, that would require some coding: How to customize image dimensions in WordPress. Hi, I don’t think that the Manual Image Crop plugin is working anymore. Is there an alternative plugin because my thumbnails are way to big in my sidebars and I have done the thumbnail regeneration twice? Hi Elizabeth, please note that the purpose of the Manual Image Crop plugin is to manually define the visible part of images that should be displayed on generated thumbnails that are being cropped by WordPress. The purpose of the plugin isn’t to change the predefined image size of thumbnails. If that’s what you want, then you could have a look at this. When sharing more than one article on Facebook, the image does not change. The new article is displaying a photo of the first post. Hi Stoyan, it’s not unusual that Facebook will use images other than the featured image if you haven’t implemented Facebook Open Graph meta tags on your website. Here you can find more information: Wrong image is being displayed while sharing on Facebook. Here’s an interesting WP plugin for featured images: WP BFI (Better Featured Image). Hi Yannick, thanks for sharing your plugin for featured images. We haven’t tested the WP BFI plugin, but it seems to be useful. Hi Tony, actually WordPress is supposed to crop your images in order to ensure consistent thumbnails on your website. However, if you feel that particular images have been cropped inappropriately, you could manually crop the images or in general customize the image dimensions for thumbnails on your website. I tried out Manual Image Crop. Didn’t work out well. But when I changed the featured image to a lower dimension and uploaded it again, the whole image showed up (this is the featured image on my blog). Thanks for your help. I like to show the image in the article and also the featured image for the article list. When I browse the articles, duplicated images are shown. I would like to show only the image that is inside the article, but not display blank images for featured images in the article list. Hi Steve, you are seeing duplicate images on your posts because you already have embedded the images manually and if there also is the featured image, then you are displaying the images twice. You can either remove the image that you’ve embedded manually or you can disable the featured image on posts so that you only display the manually embedded images on posts. in the WordPress dashboard. Unfortunately I don’t have this option. So I am stuck with the duplication on every post. Can you help me? Hi Tony, you’re probably using a free WordPress theme that doesn’t have this option available. The option to hide the featured image on posts is available once you’ve purchased and installed our popular MH Magazine WordPress theme. My option to have a featured image in posts suddenly disappeared and there is no option in my “Screen Options” for featured image. Can you help me figure out how to get it back? I am not a developer so I don’t even know where to begin. I’m not using one of your WordPress themes, but I have checked all my theme settings and do not see anything that would have caused this. Hi Holly, the option to set featured images on posts is WordPress core functionality. That means if you’re missing that option in your WordPress dashboard, then something on your site is possibly removing the option (e.g. installed plugins). You could do some troubleshooting by disabling your plugins one by one and then see if the featured image option is back. If that doesn’t help, then please contact the developers of your WordPress theme for further analysis. I’m not using one of your WordPress themes, but when I upload the featured images in my theme, they just won’t show on the pages although they were correctly uploaded. Hi Lilian, not all WordPress themes are supposed to automatically display the featured images on posts or pages. You could check the theme documentation or contact the developers of your WordPress theme in order to figure out what is supported by the theme you are using. If the featured images won’t be displayed automatically in your WordPress theme, you could still embed images manually within your post / page content through the WordPress editor. I am having the same problem with the MH Magazine theme. Featured images show fine on posts but won’t show on pages. Hi Mick, that’s correct, it’s supposed to work like that. As soon as you set a featured image for pages, the image will be used as thumbnail on archives and within widgets, but it won’t automatically appear within the content area like it is with blog posts. This is because pages are used for all kinds of purposes and having a featured image there by default often is inappropriate. If you want to embed an image within the content area on pages, you can do that through the WordPress editor like you would do with any other image as well. When I share a post on my Facebook page, a featured image from a different, unrelated post shows up instead of the featured image from shared post. How do I correct this? Hi Kate, when you share a post, then Facebook will crawl your site and use images that seem to be suitable and this doesn’t necessarily need to be the particular featured image from that post. You can improve the sharing experience by adding Facebook Open Graph tags to your website. Please see: Wrong image is being displayed while sharing on Facebook. This article was very helpful! And I’m LOVING this theme! Thank you so much for creating it! Woot! Hello! After changing my WordPress theme all post images appear quite big now. Where can I change this? Hi Daniela, after you’ve changed your WordPress theme, you should regenerate your thumbnails. If you’ve already done that and in case images are still displaying very large on your site, then this usually is because the images are being scaled by the browser (e.g. in the slider), which usually happens if the uploaded images are too small. In case you’re using the MH Magazine theme, you should ensure to upload images that meet at least the minimum requirements in size, as stated in the theme documentation. In addition you can find more information here: How to upload optimal images for MH Magazine. I noticed that the featured image in a post is at the top. How can I change the position of the image to be perhaps in the middle of the blog post to the left of a paragraph of text in a smaller size? Hi Glenn, if you’re using the MH Magazine theme, then you could disable the automatic featured image at the top of the post through the available options. After that you can embed images into your post content based on your personal needs and requirements via the WordPress editor. Hi, my images aren’t showing up at all? It keeps showing them as buffering or loading – why could this be? Hi Sarah, you may have installed a plugin that is affecting the images on your site. The first thing you could do to troubleshoot this issue is disable your plugins, clear the browser cache and then check again. If the images still aren’t loading properly after you’ve disabled your plugins, then you would need to dig deeper (e.g. possible theme issues, hosting related issues or else). Hi. I’m not using one of your magazine themes, but my issue is whenever I set the featured image, it isn’t displayed nicely to the left in a small thumbnail with the title to the right. I know how to scale the image down but it doesn’t place the image to the left, it stays centered with the title above it. Do you know how I can adjust this so it looks like the first picture example you show? Thanks. 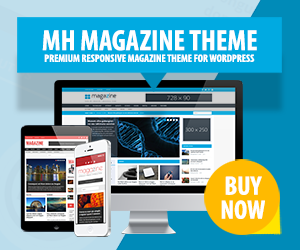 Hi Dawn, please be aware that what you can find on our website, mostly is about our WordPress themes, especially about our popular MH Magazine theme. If you’re using a different WordPress theme, your website may have a completely different layout. That also means featured images may be displayed completely different or even not at all. If you have a question about your particular WordPress theme, you would need to contact the theme developer for support.